Recuva is a good utility file recovery tool to restore deleted files, thereby locating those files which were once thought to be lost forever. It happens with almost all of us when we delete a file by a mistake, and do not find any option to get it back. Well, no matter how good you are in Computer literacy, it often happens when we actually lose an important presentation or a confidential file when our system get crashed for some reason. This is where Recuva comes into existence. The interface is very sleek, professional, and easy-to-use that helps you retrieve all important files. You just have to select a drive — C or D, or both, from the available drop-down menu. However, in case you have an idea of where that file may be, then you can also pick a path, including Music, Pictures, Documents, Videos, and Compressed files. Now, as you click on the “Scan” option, the program will start working and within a next few seconds, it will come up with a long list of deleted files including the respective path of each deleted file. Installing Recuva in Windows 8 is as easy as it is to download it in other OS. However, before I get down towards the downloading process, let me quickly jot the main features of this File recovery tool in Windows 8. Brings you deleted files in seconds. Lets you recover formatted disk. Lets you recover deleted emails. Lets you recover all the important unsaved word docs. And of course, its free! However, make sure that the upgraded version is also available. Hence, you can upgrade the program to premium one in order enjoy other amazing Recuva features. Go onto the given link. Now, you will soon find the software downloaded as you follow the on-screen instructions. Do not miss out our post on Best Windows 8 Software selected from the last week’s reviewed ones. 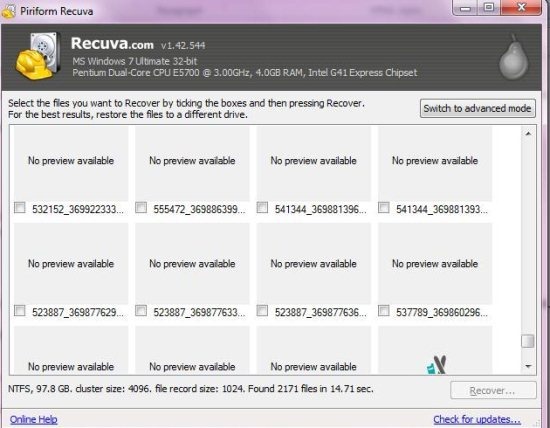 Yupp…you have successfully installed Recuva file recovery tool in Windows 8. Go ahead and try out yourself.